We are all called upon to cope with hiccups and hurricanes in our lives — losing our wallet and car keys, discovering mold in the bathroom, missing three days at the office to care for a sick child — and we do. We are resilient heroes in our own lives every day as we skillfully navigate the disruptive, unwanted changes of the washing machine going on the fritz or the car needing a new transmission. Occasionally we have to respond with grace under pressure to greater troubles and tragedies: infertility or infidelity, a diagnosis of pancreatic cancer, losing a job, a son wounded in combat overseas. 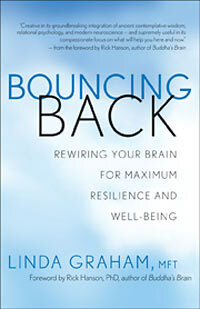 The way we can bounce back from such everyday disappointments and extraordinary disasters is through resilience – capacities innate in the brain to respond to the inevitable twists and turns in life flexibly and adaptively. 1. Calm: You can stay calm in a crisis. 2. Clarity: You can see clearly what’s happening as well as your internal response to what’s happening; you can see what needs to happen next; and you can see possibilities from different perspectives that will enhance your ability to respond flexibly. 3. Connection: You can reach out for help as needed; you can learn from others how to be resilient; and you can connect to resources that greatly expand your options. 4. Competence: You can call on skills and competencies that you have learned through previous experience to act quickly and effectively. 5. Courage: You can strengthen your faith to persevere in your actions until you come to resolution or acceptance of the difficulty. More than 80 exercises in Bouncing Back allow you to do this rewiring safely, efficiently, effectively. The tools and techniques drawn from mindfulness practices and relational psychology create and accelerate brain change and strengthen the parts of the brain we need to cope. You recover a deep resilience and well-being that will last a lifetime. The fastest way to regulate the body’s stress response and return to a sense of calm is to activate the release of oxytocin in the brain. Oxytocin is the neurotransmitter of safety and trust and is the brain’s direct and immediate antidote to the stress hormone cortisol. Oxytocin can be thought of as the neurochemical foundation of resilience. The fastest way to release oxytocin and mitigate stress is through safe touch in a soothing relationship. Fortunately, neuroscientists have demonstrated many times that even remembering or imaging someone we love and by whom we feel loved is enough to release small but regular doses of oxytocin. We come into steady calm by experiencing moments of feeling safe, loved, and cherished and letting those moments register in our body and encode new circuitry in our brain. This exercise offers a way to evoke those feelings. 1. Begin by placing your hand on your heart, feeling the warmth of your own touch. Breathe gently and deeply into your heart center, taking in a sense of calm, peace, goodness, safety, trust, acceptance, and ease. 2. Once that’s steady, call to mind a moment of being with someone who loves you unconditionally, someone you feel completely safe with. This may, of course, be a partner, child, or parent; but if the dynamics of those relationships are complicated and the emotions mixed, you may choose any true other to your true self: a dear friend, a trusted teacher, a close colleague or neighbor, a therapist, your grandmother, a spiritual figure like Jesus or the Dalai Lama, or your wiser self. Pets are also great for this exercise. 3. As you remember feeling safe and loved with this person or pet, see if you can sense in your body the positive feelings and sensations associated with that memory. Really savor a feeling of warmth, safety, trust, and love in your body. 4. When that feeling is steady, let go of the image and simply bathe in the feeling itself for thirty seconds. Savor the rich nurturing of this feeling; let it really soak in. Breathing deeply, gently, and fully activates the calming branch of our autonomic nervous system, the parasympathetic branch. The parasympathetic modulates the body-brain’s fight-flight-freeze response when we feel threatened or agitated. Breathing, or pranayama, has been a core practice in yoga and meditation to relax the body and steady the mind for over 3,500 years. Through safety and trust in connection, we come back into our baseline equilibrium. From there, with our higher, thinking brain calm and alert, we can mobilize quickly, act skillfully, and take care of business. 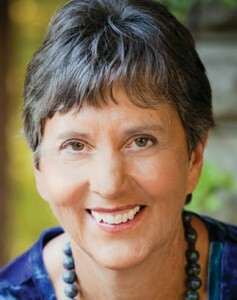 Linda Graham, MFT, is a licensed psychotherapist and meditation teacher in full-time practice in the San Francisco Bay Area. She integrates her passion for neuroscience, mindfulness, and relational psychology through trainings, consultations, workshops, and conferences nationally. She publishes a monthly e-newsletter, “Healing and Awakening into Aliveness and Wholeness”, and weekly e-quotes on resources for recovering resilience, archived at www.lindagraham-mft.net. Based on the book “Bouncing Back”. Copyright © 2013 by Linda Graham. Reprinted with permission from New World Library. www.NewWorldLibrary.com. Previous postWhat Can You Say When Your Hero Dies?